Now some people might say..."so going on safari was on your bucket list?" To be honest, you can call the list a bucket list, dream list, life's to do list, or even things that I will be bummed if I never do in my life list! I don't care what you call your list but I do care that you have a list. Now I also have much smaller things on my dream list. In fact the things you put on your list should not all be safari-size, but they should be personally yours. I love animals so we went with a group called Wilderness Safaris because I want to be more aware of animal behavior, their environment and the circle of life, as they say in THE LION KING. 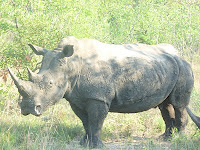 I also wanted to see the BIG 5--- leopard, lion, elephant, rhino and cape buffalo up close and personal, and I did. So I'll ask what's on your list? Do you have a list? For some people it could be pretty basic..you want a job; or a new career or more clients. For others it could be a fulfilling relationship and for others they want to fly fish in Costa Rica (remember as I work with people on their rewiring, I hear all kinds of dreams!). So as you look forward to the New Year start to take a few mintues to think about what you are dreaming about and I hope that it is more than sugar plums!